Brand new in the Skyway box. 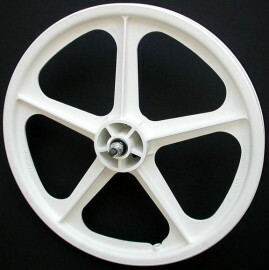 This is the original style 5-spoke mag Tuff Wheel II wheelset in WHITE. The wheel still looks the same as they did back in the day, but now feature SEALED PRECISION BEARINGS! This is the threaded freewheel style. Works with any brand 16 tooth or larger freewheels. Standard 3/8" cr-mo axles on both front and rear wheels. Fits all "Old School" and modern 20" bikes with 3/8" dropouts. Any 20" x 1.75" or wider tire will fit this wheel set. We strongly recommend using a soft compound brake pad, such as Skyway, or Kool Stop brake pads in the same color as the wheel. White brake pads and a freewheel can be added to your purchase in the dropbox.